This is it, the Bushido Samurai Sword of War! The heat treated full tang blade stretches to the end of the hardwood handle and is secured in place with a triple peg construction. The guard is intricately detailed and this sword comes complete with gold highlights from bottom to top. While this sword set comes unsharpened from the factory, the blade design appears highly aggressive in person and could be honed to a sharp edge depending on your usage needs. Bushido, meaning "way of the warrior," is a Japanese code of conduct and a way of life, loosely analogous to the European concept of chivalry. Aspects of the code can be said to have developed between the 11th to 14th centuries. According to the Japanese dictionary Shogakukan Kokugo Daijiten, "Bushido is defined as a unique philosophy (ronri) that spread through the warrior class from the Muromachi (chusei) period." I have a fairly reasonable collection of swords at all prices. This sword comes full tang and has a fairly strong feeling blade. It came fitted with a good wooden sheath and the ornaments are also good. It does not come sharp as advertised but the 440 blade sharpens well with some effort. I would not use this as a battle ready weapon. Some of the Battle machetes are harder in strength. This makes for a good show sword in the stand. Handle - 11", Blade - 27-1/4", Scabbard - 29-1/4". You can't beat this for $ 35 or even a lot more. Granted, the wooden handles don't fit EXACTLY flush but SO WHAT. You can see that you have a full tang blade and the handles are held on at three points. I hate to call them rivets cause they appear much more rugged. It does say "China" on the blade but what did you expect for $ 35 - something from the top sword makers in Japan? This is the sword that you don't mind swinging around and dinging up cause you can just get another without breaking the bank. Ding up your multi-hundred dollar swords and watch the tears come to your eyes. 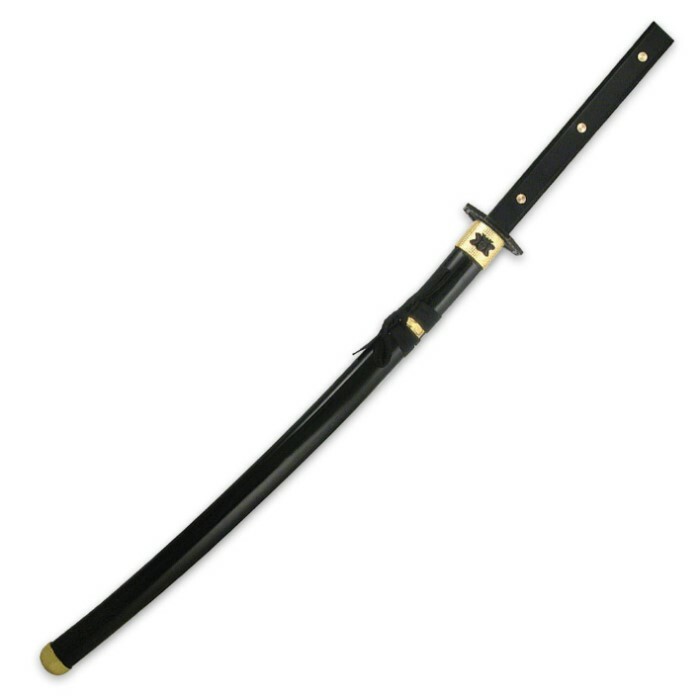 This is my favorite cheap sword, GET IT ON SALE IF YOU CAN,, it's light weight but sturdy,like a Saber,,, solid full tang with great hard wood grips, a nice ling handle (11 inches). Ignore the measurements given in the ad,,, The 26 inch blade is a solid 1/8 inch thick, no fuller groove, and it comes with a good hard wood scabbard that one would normally find on a more expensive sword.... This sword it"self is actually 38 and 1/4 inches over all, and 40 and 1/2 in the scabbard. 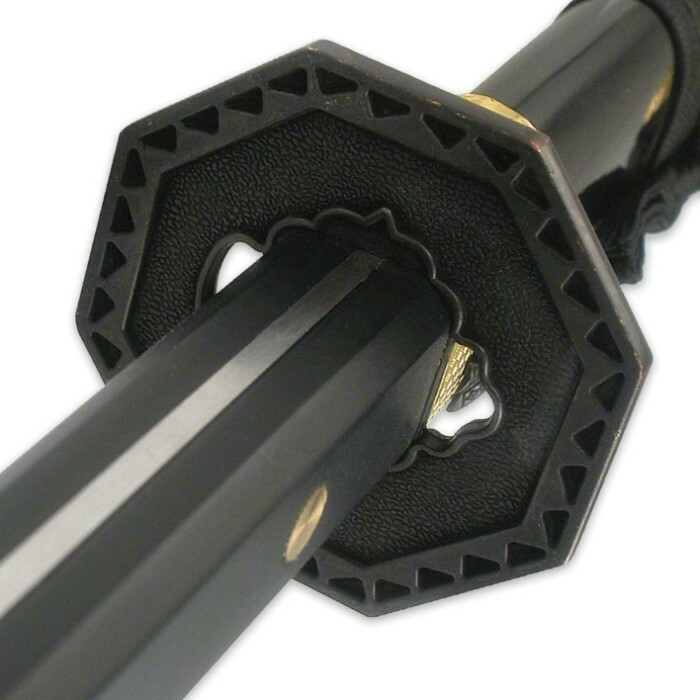 Well built with real brass rivets and a tight guard....all in all a good deal on a working sword you can have fun with. I HIGHLY RECOMMEND THIS SWORD...! Five stars for sturdy - was hoping for an edge though and the brass accents on the scabbard are plastic (so four stars overall). Very good low-priced option. Took a chance and bought one before any reviews were added. Nice 440 SS blade and the feel is great. Have to work up an edge and she'll be a keeper. Actually a pretty good sword for the money. No blood groove,but sturdy,so the point is workable, slightly curved and the handle is a nice length....It took some grinder disk, sanding disk and sand paper block and leather strap work, but this thing is made from pretty good Stainless Steel, holds a razor sharp edge that can slice the hell out of fruit or flesh. The full tang blade, with real wood handle and actual rivets make this sword a real keeper, and a go to blade for some back yard fun as well as a serious weapon,,good service blade at a nice price here.,I suggest buying two,, one to admire and one to play with. 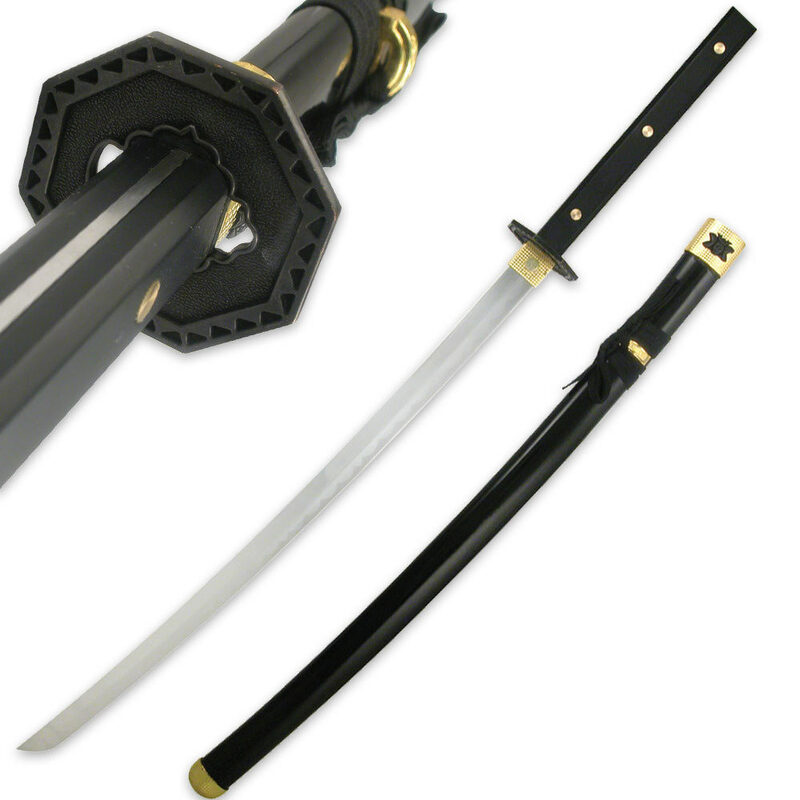 For a good practice katana you cant beat this one for the price. Durable yet balanced almost perfectly. The longer handle is a little more than what I'm used to but provides nice leverage for that extra boost from the hips. It Seems the more I work with it the more I like it. and all for $40 & some change?... You just can't go wrong with this one. I'm gonna buy a couple more...Not to hard to polish a decent edge on one of these either... I recommend wrapping the handle with rubber insulating tape or a good electrical conduit shrink that will tightly wrap the handle(1½" should do it)....Polish up the edge and it becomes a workhorse for all your melon, straw & water jug & intruder needs....Hope no one gets in the way...Have fun.....I have. Awesome sword. Well built, high quality and just plain beautiful. The only downside is that it came almost completely dull, though that isn't too much of a problem for my sharpener. Definitely recommend it.